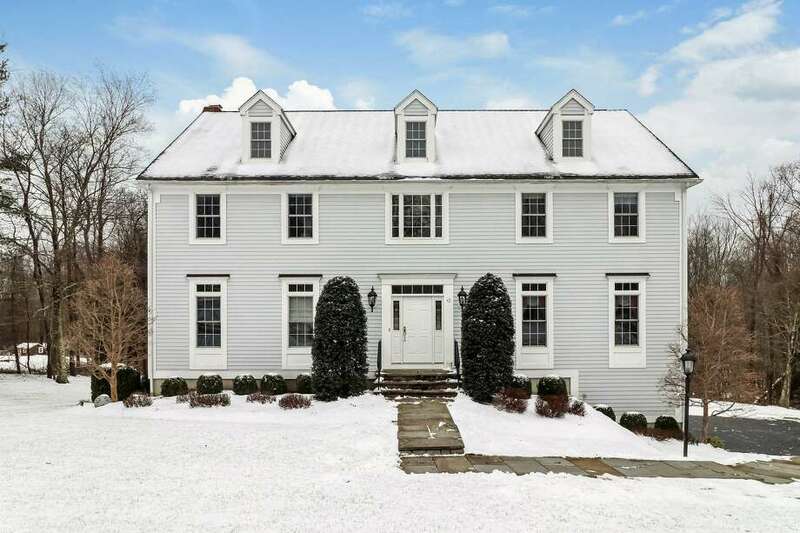 The gray colonial house with white trim at 42 Vista Drive sits on a level and very gently sloping property of just over three acres on a quiet cul-de-sac. EASTON — Easton’s bucolic countryside is dotted with many working farms and horse properties. Among these agrarian features there are many elegant residences, including the gray colonial house with white trim at 42 Vista Drive. This house sits on a level and very gently sloping property of just over three acres on a quiet cul-de-sac. The driveway opens in front of the attached under house three-car garage providing ample parking for guests. Stone and slate steps travel from the driveway to the front entrance, where the door is flanked by decorative leaded glass sidelights. The nine-room, turnkey house has many architectural features that add to its visual appeal and livability starting right at the front door. The entablature above the transom of this door depicts dentil molding, and inside that molding is repeated in the entablature of the wide entryway of the formal living room into the formal dining room. It is repeated again in the mantel of the living room fireplace and in the second floor molding, serving as a unifying element throughout the house, which was built in 2001. In the living room, the gas-fueled fireplace has a marble surround and there is decorative wainscoting on the lower walls. There is also a built-out area for a television. Throughout most of the house there is hardwood flooring, and throughout the main living level there are speakers for surround sound in the living, dining and family rooms, office and in the kitchen. The dining room features chair rail molding, double crown molding, a tray ceiling with a rosette medallion from which the chandelier is hanging, and wainscoting on the lower walls. The hardwood floor in this room features a walnut stain and a double inlaid border of darker wood. Pocket doors separate the dining room from the spacious kitchen when family members prefer a private dining experience. The newly updated kitchen features remodeled white cabinetry, a center island/breakfast bar, quartz countertops, a double-door pantry with a California closet system, Carrara marble tile backsplash arranged in a herringbone pattern, and television hook-up in which the wiring is not visible. New stainless steel appliances include a GE five-burner cooktop, double ovens — one of them convection — and dishwasher. Sliding doors in the breakfast book lead to the large wood deck. In the family room, there are French door to the same deck, as well as the home’s second fireplace, this one comprising red brick and it is also gas-fueled. It has a gas inset and can be converted back to a wood-burning fireplace. It has a custom mantel with dentil molding. This wing of the house also has the office with enough space for two desks. On the second floor there are four bedrooms. The spacious master suite has a sitting area, four windows with Hunter Douglas blackout shades, ceiling fan, two walk-in closets with California closet systems, and a private bath with a jetted tub, shower with a new steam-less glass door, and double vanity topped in granite. The full unfinished walk-out basement offers future additional living space and possibilities. The house is easily accessible to the Blue Blaze Trail, managed by the Aspetuck Land Trust. For more information visit www.bethsaundersrealestate.com. To make an appointment to see the house contact Janet Bottiglieri of Berkshire Hathaway HomeServices New England Properties at 203-733-1031 or janetbottiglieri@bhhsne.com.